The Man Bird and I have visited The Orangery restaurant at St Elphin’s Park in Darley Dale a few times now, and it’s lovely to see how things are constantly changing and evolving. The visit on this occasion was initially suggested by a new member of the St Elphins team, Teresa, who we got to meet when we visited to try the new spring menu. Fiona had got the evening off, so Zoe was Restaurant manager for the night, ably assisted by Teresa who was a ray of sunshine and clearly a hit with the owners that were already dining. 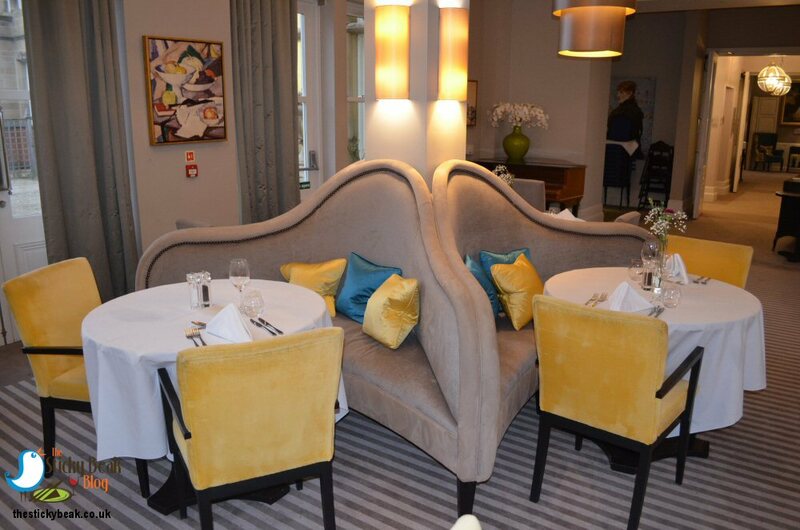 For two Friday evenings in February (1st and 8th) The Orangery team are hosting their popular Seafood Friday menus, as well as the regular selection of dishes, and the Fish and Chips were certainly proving popular; mind you, they did smell and look absolutely delicious! His Nibs and I had arrived a little early, so we took advantage and snagged ourselves a couple of comfy chairs in the Bistro area. I love this space, as you know from previous reviews; there’s just something special about it that makes it modern and bright, but relaxing at the same time. Rebecca was running a tight ship at the bar, supplying all manner of alcoholic beverages and fresh teas and coffees to the restaurant. 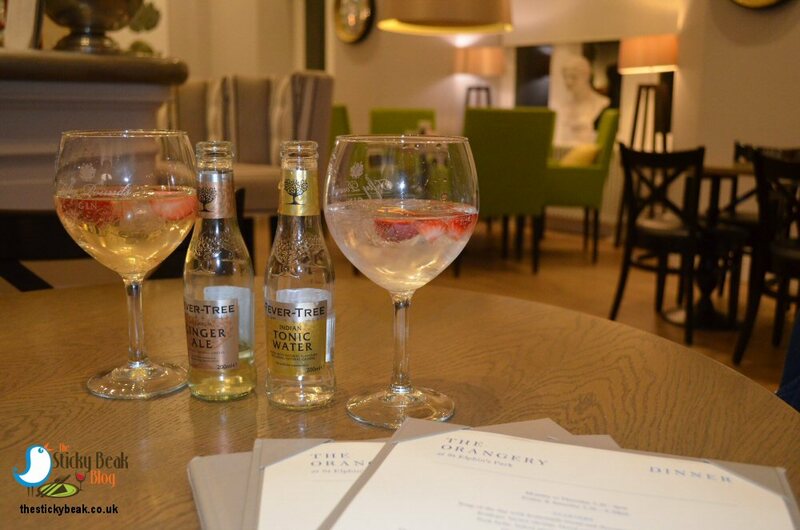 The Bistro has got a rather snazzy new Gin menu, so we thought we’d have a pre-dinner tipple (as you do! ); Him Indoors had the Bloom Gin served with Fever Tree tonic and dehydrated Strawberries, and I chose the Brockmans Gin with Ginger Ale and Blackberries. Rebecca came back apologising as Chef Scott had purloined the last Blackberries – no biggie, Strawberries worked just as nicely. The best bit? All Gins are large measures (50ml), now that’s my kind of drink. 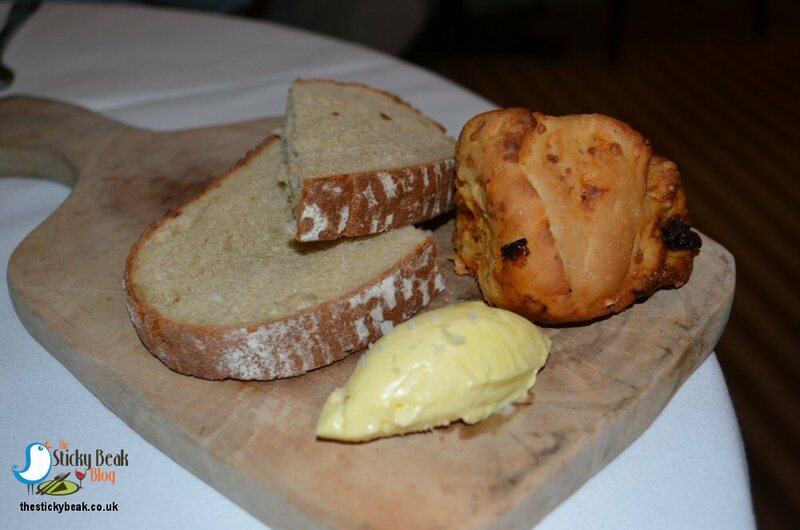 At The Orangery at St Elphin’s Park, a platter of breads and freshly done butter is served for you to nibble on as you peruse the menu. Very kindly, Zoe brought ours out to us in the Bistro, which made a lovely change. 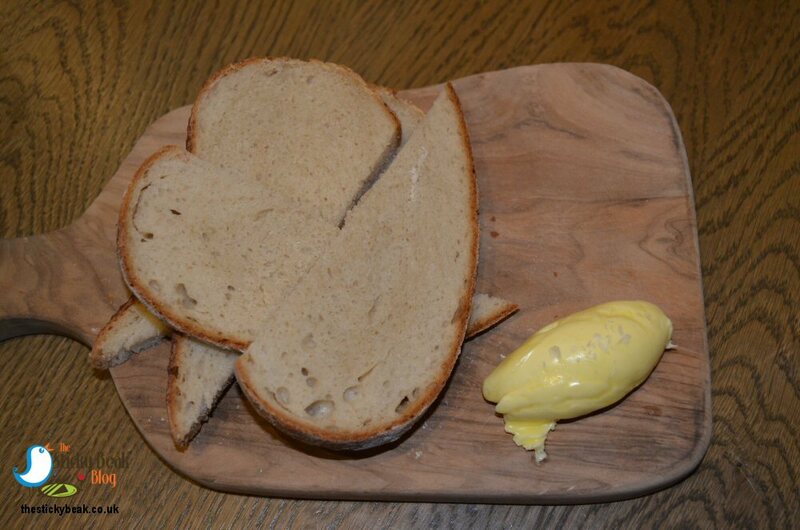 The slices of homemade Sourdough bread were served with a stylish quenelle of Truffle butter, whose creamy surface had been lightly scattered with Sea Salt flakes. Both His Nibs and I loved the lightly bouncy texture to the Sourdough, and the fact that it didn’t have a massively thick crust made it an awful lot easier to manage! Teresa escorted us through to The Orangery, and it was lovely and lively – and that’s before you factor in the debate that a table near us was having about Brexit! There was a diverse mix of dining groups; couples, quartets, a larger group celebrating a birthday with friends and family, and groups of owners that were dining together. 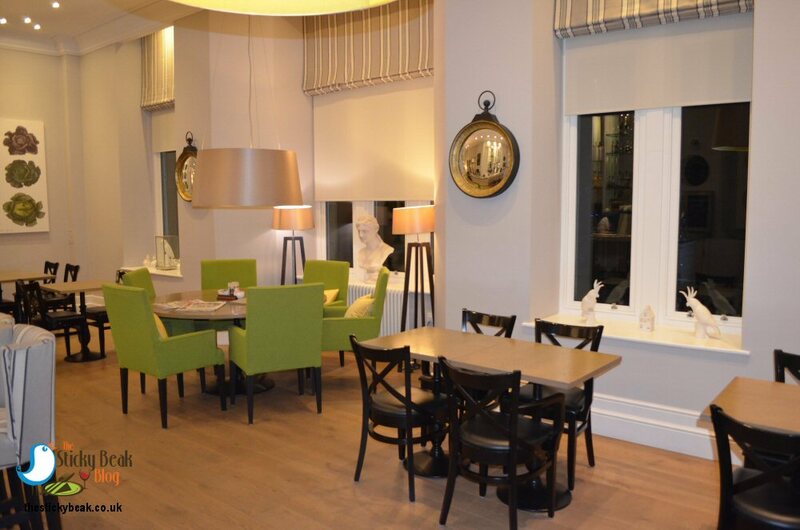 Please don’t forget that YOU DON’T HAVE TO BE AN OWNER TO DINE AT THE ORANGERY, whatever the time of day!!!! You don’t have to be an owner to join the Health Club either, but that’s a whole other story; Zoe did take us on a quick tour around after dinner and it was fantastic. Perhaps I should go and do a feature on the facilities there and tell you all about it; I peeked through the window at the gym and it has all the mod cons in it! 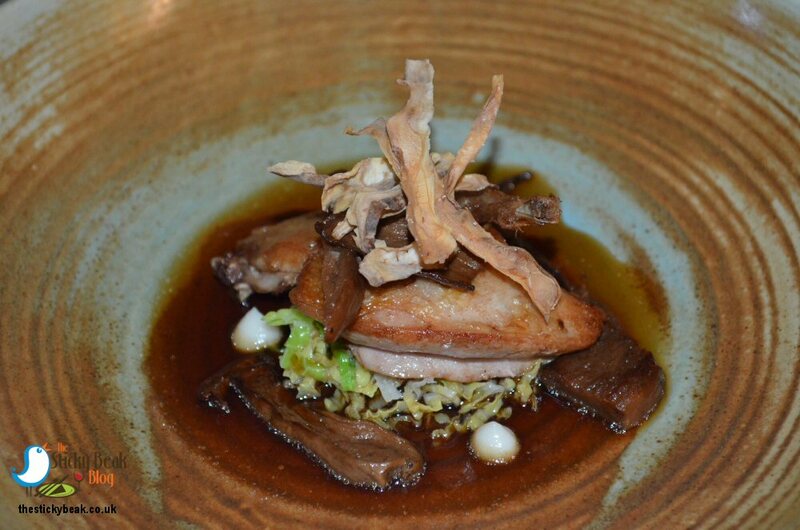 For starters we’d chosen the Soup of the Day (which was Spicy Thai vegetable on this occasion) for The Man, and Quail, Artichoke, Ceps, and Confit Leg for yours truly. As we waited for our starters to arrive we realised that it was the first time we’d dined when the night was truly upon us; the stylish lights cast a wonderful ,diffuse amber glow to the restaurant that made it even cosier than usual. It didn’t take long for our starters to arrive, and boy did they look good. My Quail had been carefully cooked to retain the moistness of the tiny birds’ meat, and it had a lovely light game flavour that wasn’t perhaps as robust as a lot of people might assume. I would probably describe it as a “porky” Chicken; it’s deeper than Chicken but nowhere as deep as pheasant, say. The confit leg meat is discernibly more gamey in taste, as you would expect from dark meat. Crunchy slivers of Artichoke gave a beautiful textural element to the dish, and I just adored the earthy, musky taste of the Cep Mushrooms. This was definitely one of those starters that get the taste buds full of anticipation for the following courses. Both The Boy Wonder and I were surprised when the Spicy Thai Vegetable soup arrived; we’d been expecting a consommé –style thing, you know the ones that you get in a lot of restaurants with the pale liquid that has noodles and stuff floating in it. 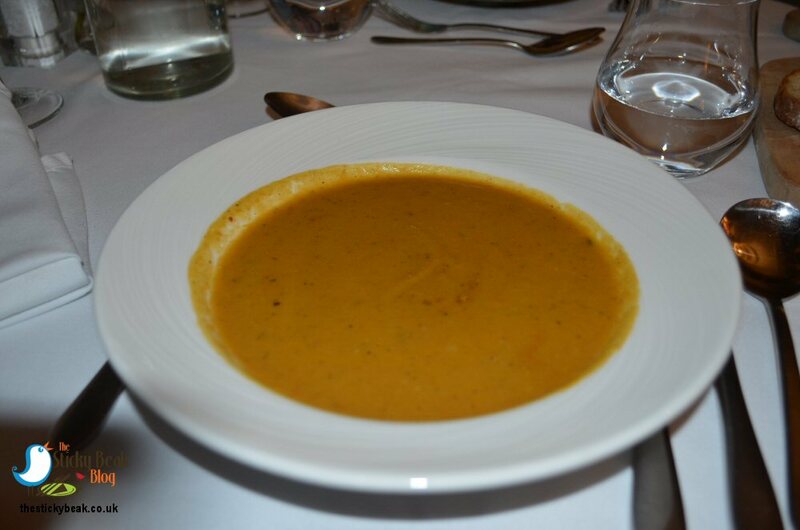 Chef Scott had done more of a rustic type soup for his interpretation; it was a blended soup with a good bit of body to it and had a superb saffron colour. This soup had a fantastic bite to it that released its heat at the back of the throat after a couple of seconds. Those who aren’t sure about spice need not panic; there was no hint at all of any lip or tongue tingle action. Think of that exquisite heat when a fine brandy is sipped and you’re getting the idea. More of Chef Scott’s sourdough came with the soup, as well as a beautiful sundried Tomato and Cheese dinner roll – nom nom. His Nibs has really got into Scallops recently, something I never thought to see, so when he spied them on the Seafood Friday menu he jumped straight in and bagsied them before I had chance to utter a word! The seared Scallops came with Pork Belly, Tomato and Chorizo Salsa and New Potatoes or Bistro Fries; he was allowed to swap for the Triple Cooked Chips instead, as the team know how much he loves them! It was a close run thing choice though, between the Scallops and the Homemade Pie of the Day; only the fact that the pie was Chicken and Mushroom stopped him having that – he has a shocking aversion to Mushrooms (tut tut!). 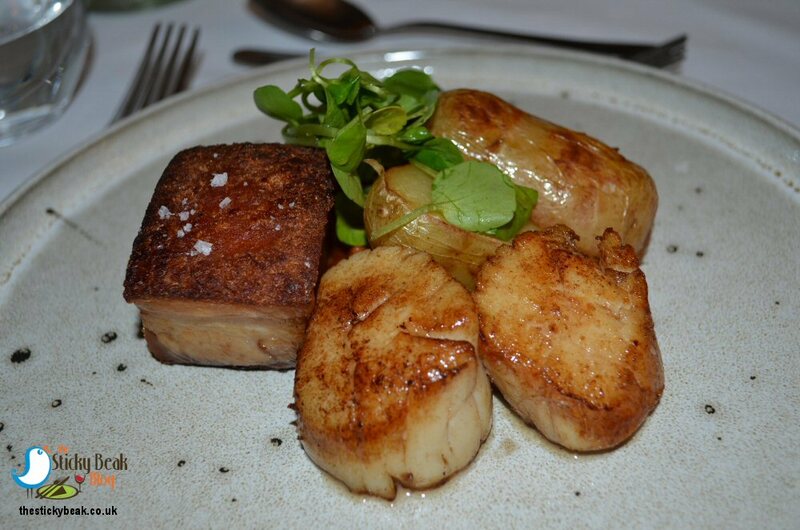 I kid you not dear reader, the pair of seared Scallops were the size of the Pork Belly when put together –they were huge! Large does not mean tough or flavourless though; these beauties were kitten-soft and had delightfully sweet, fragrant flesh which made them an absolute pleasure to eat. The Pork Belly was also magnificent in all its succulence, and I was passed the best bit of it – the crackling- to try. I’ve got to hand it to Chef Scott; the boy can make a cracking bit of crackling, and no mistake. Both the Scallops and the Pork went superbly with the smoky, spicy Chorizo and Tomato Salsa. This salsa was a bobby dazzler, and the spicy Chorizo had been perfectly tempered by the sweet Tomato within it. 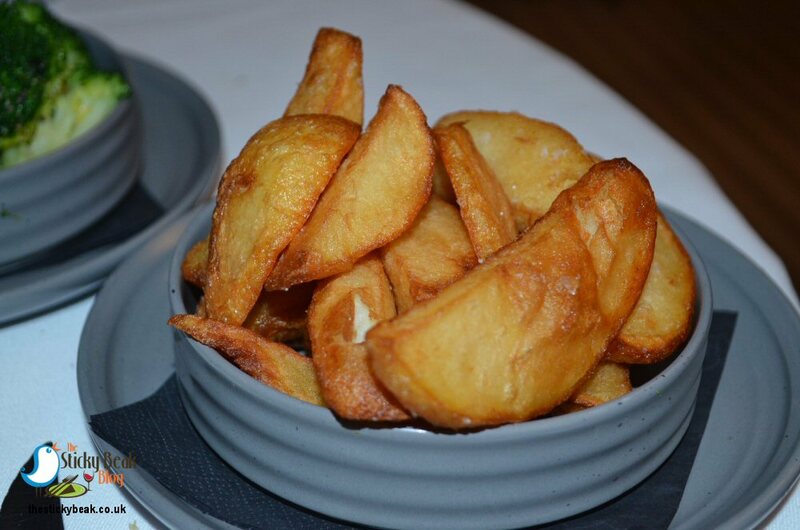 The chips, it goes without saying, were delicious and cooked that rich golden brown that Mummy Bird used to do them when she had the old chip pan. Ah, fond fledgling memories came flooding back as I pilfered one. I am an inquisitive bird as you all know, and as soon as I spotted Wasabi Croquette listed I knew I had to try it! 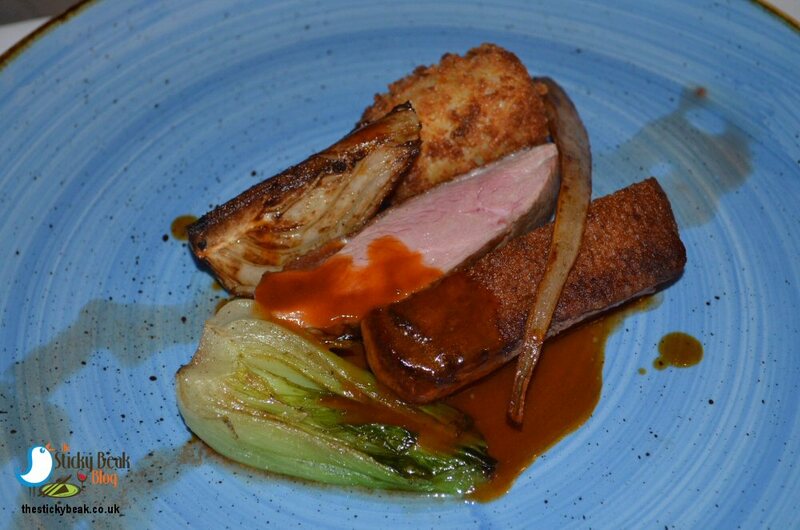 Luckily I love Duck, Fennel, Salsify, Ginger and Lemongrass, which is what accompanied the Wasabi Croquette. Wasabi is an odd taste, and one that you need to have a few times to get accustomed to; I have had my fair share of moments with it, when I’ve over-indulged and got a massive case of the sneezes afterwards! Imagine Horseradish on steroids and you’re getting the gist of what I’m trying to say. BUT, and it’s a big but, used properly and carefully in cooking, this member of the Brassica family imparts a much gentler heat than when made into a paste and used as a spice. I’m not sure how Chef Scott combined it into the lovely Potato croquette, but whatever Cheffy alchemical thing he did, it was beyond superb! Once I’d cut through the uber-thick crunchy coating of the croquette, I was rewarded with a velvety mash and wasabi centre that had an incredible, rounded heat to it; no sneezes or reaching for the water here, just that comforting warmth in my belly. Luckily, the duck was every bit as delicious and very generous in size. The large breast had been cut in half lengthways to reveal a pink centre and that satisfyingly dense texture so typical of duck. Fingers of Salsify and a halved bulb of Fennel had been nicely charred and cooked to release their characters skilfully. Factor in the Ginger and Lemongrass components of this dish and you can imagine the riot of tastes and textures that it was; I defy anyone not to love this dish once they’ve tried it! 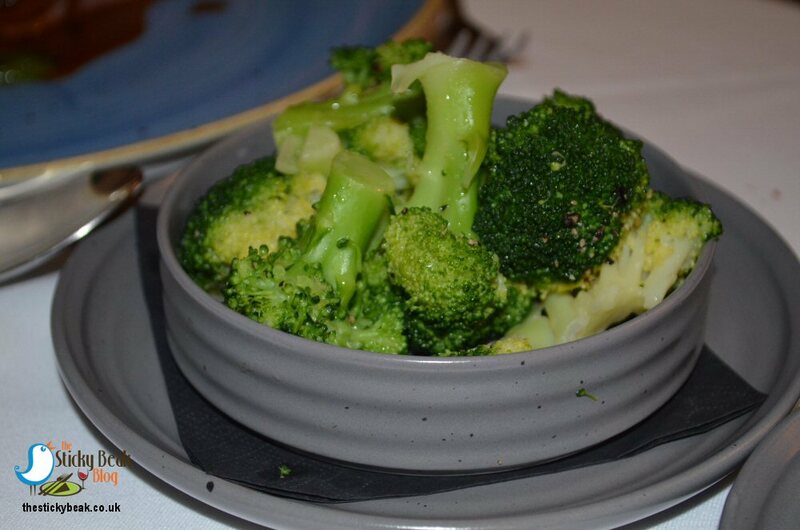 Zoe had recommended that I order a side dish as well, so I opted for the Broccoli, which when it came was subtly glossed with melted butter and still had a nice firmness to its florets. For those of you that like to indulge in a scoop or two of Ice Cream for dessert, you need to get to the Orangery at St Elphin’s Park in Darley Dale pronto tonto! The choice is quite staggering, although I have to say that His Nibs heard the words “salted caramel” and didn’t hear anything else! “Rum and Raisin” had the same effect on me, but I did hear the other half dozen or so choices too! The Man Bird opted to have his beloved Sticky Toffee Pudding for dessert, and it comes with a Toffee sauce and Ice Cream at The Orangery. Teresa gave one of her smiles as he chose Salted Caramel Ice Cream – let’s face it, it was never going to be anything else was it? 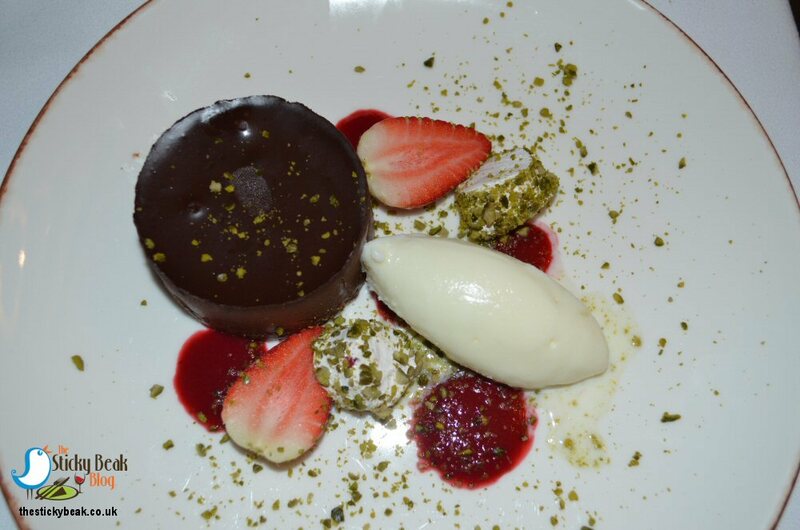 I fancied the sound of the Chocolate Cremeux, with Raspberry and Pistachio Nougat, and Milk Ice Cream. I couldn’t tell you the last time I had nougat, and the one Chef Scott produces was worth the absence. It had a wonderful softness and sweetness to it, and the Pistachio crumb on its outside was gorgeous; the addition of vibrant Raspberry coulis was what really got the taste buds bouncing around like Tigger though! It was this fruity element that also contrasted nicely against the decadently rich Chocolate Cremeux, whose bitter edge really sparked the Raspberry alive. Silky milk Ice Cream brought things down a notch and cast its gentle embrace around the other components of this dessert, bringing coherence to this marvellous pudding. His Nibs couldn’t believe the size of the portion of Sticky Toffee Pud that was placed before him – it was surely meant to be shared?! Nope, it was all for you, fella –tuck in! Fortune favours the brave they say, and thankfully the pud had a wonderfully light texture that didn’t weigh heavy on the tummy. Taste-wise though it was a real heavyweight; rich and deep in flavour, and partnered perfectly by an unctuous Toffee sauce that coated the mouth and lingered a while, comfortingly. 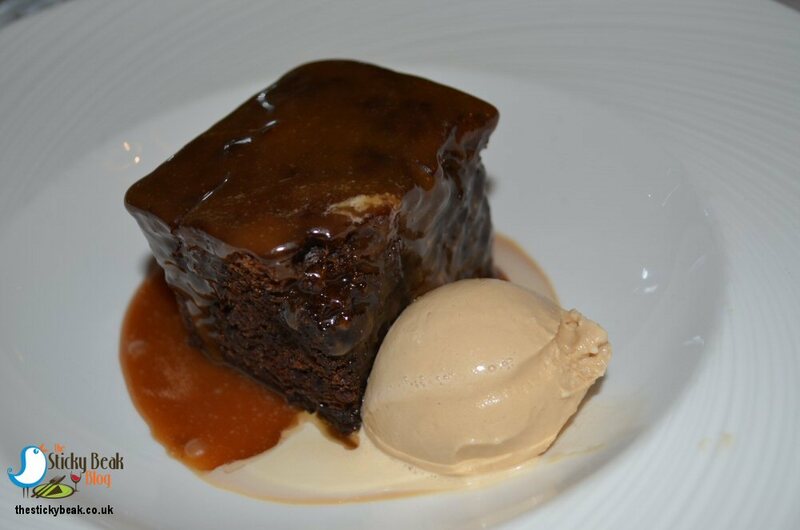 Good quality Salted Caramel Ice cream contrasted well temperature wise against the warm pudding and it melted into the Toffee sauce, begging to be swirled together – yummy! 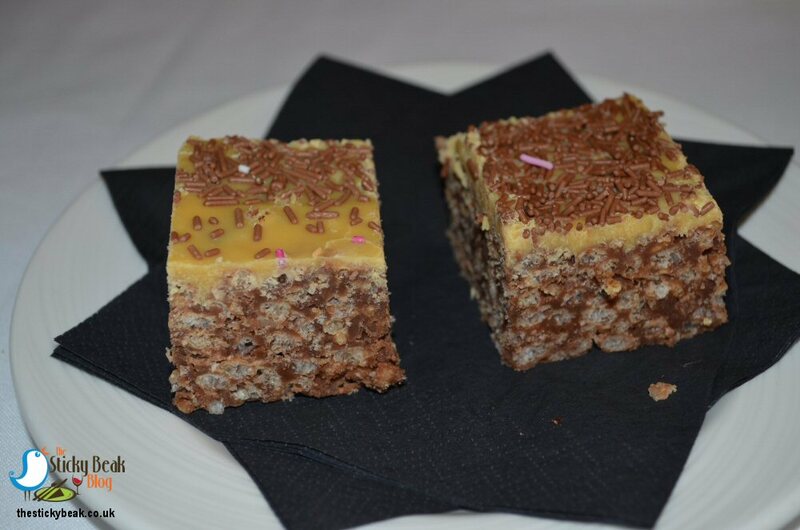 Chef Scott’s team make all sorts of fabulous biscuits, cakes and cookies and we were fortunate enough to have squares of Rice Crispie cake to go with our post-dinner coffees. Crikey they were good! What great way to round things off. Hot Wings happily given to The Orangery team again, the spring menu has got a superb range of choice on it that I’m sure will please all who try it. 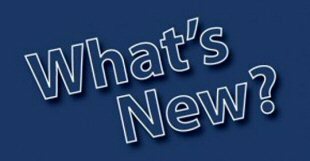 I know I mentioned it earlier, but don’t forget that you can dine at St Elphin’s Park, Darley Dale at any time of the day without being an owner there. I would recommend ringing ahead though, not only to book a table, but also to check that they don’t have a closed function on.